Obituary – Samuelson, James Lamont « Perry High School Alumni Association, Inc.
James Lamont Samuelson, 50, Oklahoma City, a native of Perry, died at 5:30 a.m. Sunday in Veterans hospital, Oklahoma City, where he had been a patient one month. Funeral will be at 2 p.m. Tuesday in Parker chapel with Rev. Tom Kirby, pastor of the First United Methodist church, officiating. Burial will be in Grace Hill cemetery. Samuelson, a 1940 graduate of Perry high school, was born Aug. 15, 1922, in Perry, where he was an electrical contractor from 1953-62. He served with Battery C of the 158th field artillery, 45th division, from 1939-45. 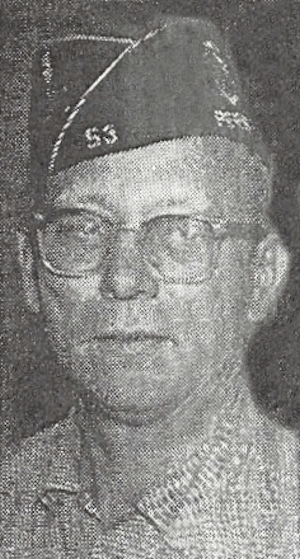 Samuelson’s usual occupation was housing inspector for housing and urban development authority, Oklahoma City, and he had resided in Edmond and Oklahoma City. He was a member of the Methodist church, Masonic lodge, American Legion and Veterans of Foreign Wars. Survivors include two daughters, M. Larry (Sonja) Shelby, Moore, Okla.; and Callie Gayle Samuelson, Edmond; three sons, James V. Samuelson and Scott Aaron, Edmond; and Kevin Todd Samuelson, Gore; one step-son, Barry Coppage, Houston, Texas; one stepdaughter, Mrs. Fred (Connie) Baird, Mobile, Ala.; his mother, Mrs. J. A. Samuelson, Perry; three sisters, Mrs. Fred (Maurine) Peters, Del City; Mrs. Carl (Genevieve) Carmichael, Coronado, Calif.; and Mrs. Jean Nicewander, Tulsa; and four grandchildren.